This is a book to get lost in, not just in the usual way of books, but in a way that is haunting and will have you musing for days and days, long after you have turned the final page. For nothing is simple when it comes to this novel. The plot moves from climax to climax as you might expect from a novel that was originally serialised . But it is the depiction of characters that is most perplexing. We cannot quite figure out if we like the main characters but are compelled to take this figurative and literal journey with them into the heart of China. Who is the real hero, the true villain? Some of the time I side with the main female character and at others I feel nothing but chagrin for her. In this regard, Maugham is a first rate author, he keeps you analysing and reassessing every word and act. The novel begins in China, 1925, between the wars, when British civil servants and citizens were becoming more and more unwelcome in the Far East. Shallow, spoilt Kitty Garstin has married Dr Walter Fane, a bacteriologist living in China just so that she can walk down the aisle before her younger sister. This British couple have little in common. She does not love her quiet, reserved husband, and barely knows him at all. His passion for her is superficial, loving her like a doll in an Ibsen play. The scene is set for an extra-marital affair which duly takes place. On its discovery, Walter, a great bridge player, makes an unexpected move and volunteers his medical services in the cholera-ridden Mei-tan-fu district. His wife is given an ultimatum: she must accompany him on this suicidal expedition, or face disgrace and divorce. And so we come to one of the main themes of this novel: freedom. In a wild attempt to free herself form her overbearing, condescending mother, Kitty runs thoughtlessly into a loveless marriage. Then, to free herself from the boredom of married life, she throws herself into a passionate affair with a selfish, serial womaniser. Next, trapped by the shameful discovery of her adultery, she is forced to face certain death and journey into the centre of the cholera epidemic at Mei-tan-fu. Her desire for freedom is so intense, her desperation is almost palpable. 'Freedom! Not only freedom from a bond that irked, and a companionship which depressed her; freedom, not only from the death which had threatened, but freedom the love that had degraded her; freedom from all spiritual ties, the freedom of a disembodied spirit; and with freedom, courage and a valiant unconcern for whatever was to come'. As such, this in some ways reads as a modern text, having much to interest students of feminist criticism and a lot to recommend it to women of every generation. The book ends with a declaration that mother's must teach their daughters not to make the same mistakes as the previous generation and in their turn, they must embrace true, spiritual freedom and not become the playthings of men, selling their freedom in return for material comfort. Yet, in a very disturbing way, this is also a novel of its time. In one chapter Kitty describes the appearance Chinese orphans in such a demeaning way that every feeling revolts. Similarly, a mentally ill child is referred to as 'it' and 'the creature', which only serves to demonstrate the ignorance of the character and society in general in 1925. One of the nuns points out to Kitty the beauty of all living things and soon Kitty's attitude changes. It is unclear whether Maugham is trying to illustrate the shallowness of his main character through her prejudicial comments, or if he is actually revealing his own. Either way, it makes for very uncomfortable reading. Opposing notions, such as the beautiful and the grotesque, are ever present in this text. Indeed this is a book about the antithetical nature of human relationships, the fine line between love and hate, passion and anger. Such basic human emotions are twinned in the hearts of men and women and it doesn't take much to exchange one for the other- or so it is in the world of William Somerset Maugham's imagination. 'I despise myself' Walter tells his wife. Dr Fane hates himself for loving Kitty so much and for choosing the wrong wife. He has come to Mei-tan-fu to kill himself, if she dies it is a bonus. His passion for her is all consuming and that is his flaw. Like a character from a Shakespearian tragedy, he loved Kitty to distraction and finally to insanity. He forces her to face her guilt and to look upon death at very close quarters. He is essentially mad in love and his madness makes him act in a cruel and calculating way that is so opposed to his usual character. The possessive passion of Walter Fane has grown so corrupt that he takes his adulterous wife deep into a cholera epidemic, in the hope that one or both of them will die. He would rather that than watch her leave him. He little foresees how the trip to Mei-tan-fu will soften his own anger, will allow Kitty to soften too and develop a selfless understanding of other people. She slowly comes to the realisation that she is a frivolous fool, while Walter is a kind, generous, brilliant doctor who saves hundreds of people and defeats the disease. Once he discovers that she is pregnant, however, he has a change of heart and wants her to leave. He has a great capacity for love and in Mei-tan-fu it pours out on the wretched poor and sick. In this way, the passion for his wife is redirected and channelled into something more positive. In Mei-tan-fu, Kitty comes to see the change in Walter and recognises his greatness. She misses his affection when it is gone and his tenderness. 'What was it in the human heart that made you despise a man because he loves you?' she asks. Walter had 'an exquisite kindliness', she admits. On some level I think she has come to love Walter, but cannot face the reality, feeling, perhaps, that she does that she is not worthy of love - never having known it as a child. When she learns that Walter loved babies she cannot fail to recognise what a good husband and father he could have been. Yet, she cannot forget that he took her to Cholera ridden Mei-tan-fu. She sad truth is she fears him. The subtle sense of fear and hostility that underlies this novel reminds me of Conrad's 'Heart of Darkness', or James's 'Portrait of a Lady'. Here too the central characters have to come face to face with their own weakness and her own failings. Kitty Fane is faced with the suffering and death of countless strangers and is so touched by the experience that it is like the 'dark night of the soul' for her. She is forced to accept her faults and to realise that she sold herself for so little, not fully knowing the cost she would have to pay. Hers is a nature that is weak and governed by rudimentary, animalistic passions. She believes she is capable of self-control, but ultimately learns that she takes pleasure in being the plaything of men. Like Conrad's novel, this text traces a journey into hell on earth. There Kitty knows what true terror is. Yet, ironically, both Walter and Kitty find redemption in Mei-tan-fu. She learns to be selfless, he leans to use his passion for good. How strange it is that it is in this hellish place that she is touched by a godlike calm and beauty, owing to her contact with the saintlike nuns at the infirmary convent. These women are the foil for her loveless mother. Here she finds positive female role models who teach her the merits of selflessness and grace. They adore Walter more than she ever could and the teach her to appreciate the goodness in the man she has married. They emphasise the spiritual in the world, and help eradicate the physical obsession that embodied her affair with Charlie Townsend. This is a a dark, twisted tale about a couple bent on suicide because they hate each other. Yet it also about great passion and desire. The wonder is that Kitty does not see the beauty in her husband, why she does not succumb to the brilliance of his great mind, that so enchants the nuns in the convent, the local Chinese guards and the forgotten little orphans. But as I said earlier, this is a book to keep you wondering, be it about the book's title, taken from a poem by Shelley, or Walter's famous reference to Oliver Goldsmith's poem, 'The dog it was who died'. 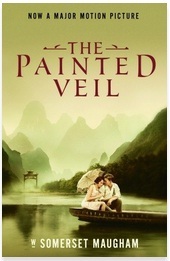 I thoroughly recommend 'The Painted Veil' for those of you who wish to be transported into another time and place, where good and evil walk side by side and sometimes call themselves by other names.